Looking for a stunning designer outfit for this wedding season? Take a look at 20 gorgeous bridal lehengas inspired by rains and monsoon motifs! Rainy season is about dancing peacocks, colorful rainbow, fluffy clouds, gray skies, umbrellas, raincoat layers, and ofcourse drops of rain falling graciously from up above and beyond. If you are a monsoon bride, or a bridesmaid or just about attending the wedding of rains, then you have to take a look at 20 gorgeous designer bridal lehengas inspired by the monsoon motifs. The color palette has been inspired by the vibrancy and spontaneity of the season. From aqua green to rusty orange to bright yellow to purple, magenta, and bridal red, Zuri has thought through wisely. This lehenga collection is apt for a bride who likes a bit of a quirk and also suits that bride who is looking for a lot of bling. Moreover, one can wear it at pre-bridal functions and post-wedding lunches and dinners as well. Velvets, chiffons, silks, and nets.. They are all bound to add so much of glamor on your wedding day. Take for instance the set of couture pink and gold silk bridal lehenga with resham and dori embroidery and zardosi beads. It is just beautiful. Suits all skin tones. It comes along with a pink fully embroidered sleeveless blouse with hook closure at back. It also features a pink organza dupatta and an orange net dupatta. And if that is a definite yes from you then here is another one as an appetizer. 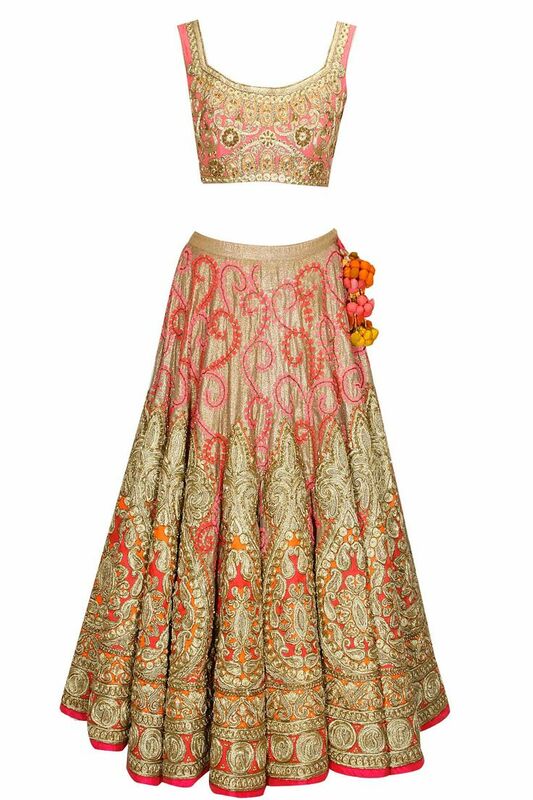 Featuring a peach net cutwork embroidered lehenga with striped gotta border all around the hem. It is paired with mint green cotton silk cutwork embroidered blouse with deep back and tassels. It also comes along with yellow soft net embroidered dupatta with scalloped gotta lace border with a hint of peach silk. And if you are looking for something bright, like the sunny intervals on a cloudy day, then here is a lehenga that features an orange silk blouse with tassel at back. 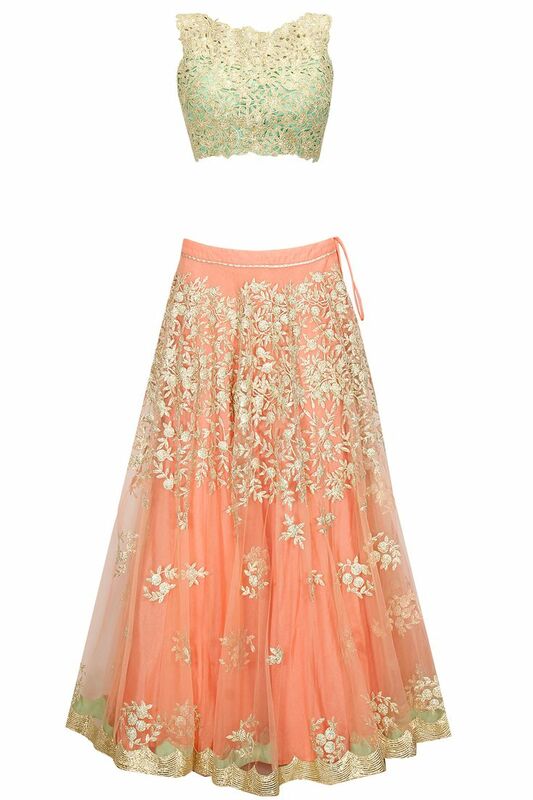 It comes along with an orange net rose embroidered lehenga with floral printed underskirt, and orange embellished net dupatta.